From the author of Medieval Artefacts, this exciting new title is produced in full colour with over 450 Celtic and Roman artefacts beautifully illustrated in over 140 pages. This superb book contains a wide cross-section of artefacts of the Celtic & Roman period including: - Bronze & Iron Age Artefacts - Fibula Brooches - Plate, Crossbow & Early Saxon Brooches - Buckles & Military Equipment - Locks, Keys & Knife Handles - Spoons, Cosmetic Grinders, Medical Implements & Seal Boxes - Jewellery - Cube Matrices, Lead Seals and Gaming Pieces - Pottery & Bronze Utensils - Steelyard Weights & Bronze Mounts - Figurines & Votive Objects - Genealogical Chart of Roman Gods - Select Bibliography. This great book covers the period following on from Celtic & Roman Artefacts. Together with "Celtic & Roman Artefacts" and "Medieval Artefacts" (also by Nigel Mills) - completes the historical series covering detector finds right from the Bronze Age to Tudor times. 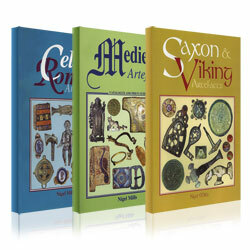 Illustrated in full colour and with over 250 superb photographs of individual objects, it encompasses the full spectrum of everyday items in use in Anglo-Saxon England in chronological sequence. The selection of illustrations has been built up over a period of 15 years from various collections. The objects covered include: buckles, strap ends, pins, cruciform brooches, disc brooches, animal brooches, jewellery, beads, stirrup mounts, wrist clasps, dress hooks, keys, knives, tweezers, weights, gaming counters, and weapons. There is also a Norse mythology genealogical chart of the gods. Each item is individually valued in two states of preservation, Fine and Very Fine, and there are additional notes and advice for collectors. The book is an invaluable reference work for metal detectorists, collectors, dealers, museums, and archaeologists. Price guide for every item in two grades of condition.